Want a warm and cozy Fall dessert? 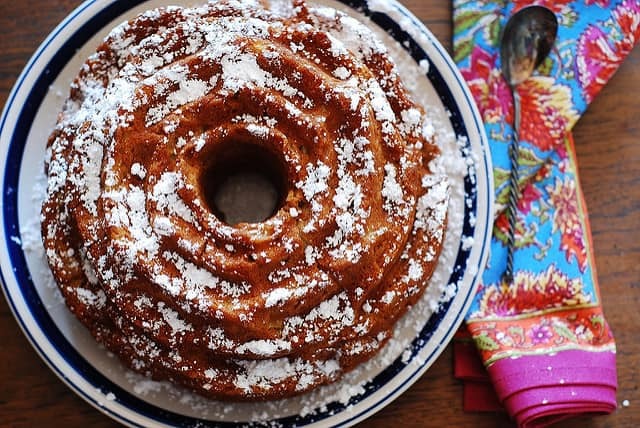 Then look no further than this apple and cinnamon coffee cake recipe (made with buttermilk or kefir) made in a rose bundt pan. 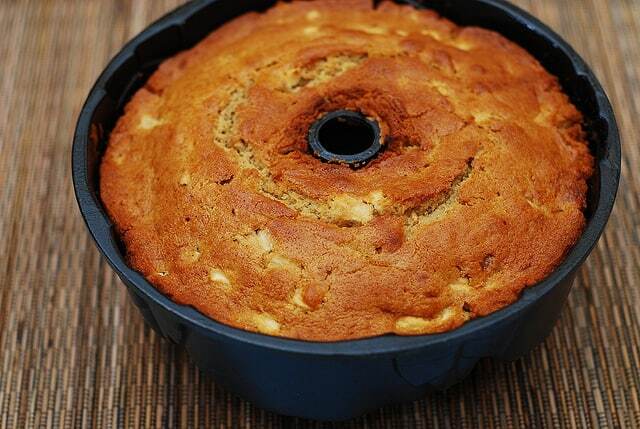 This easy-to-make apple cinnamon bundt cake recipe makes abundant use of Fall’s fresh sweet (and tart) fruits and flavors, without overwhelming them with too many other flavors. What you get with this recipe is a cozy Fall treat, and all you’ll want to do after you bake this is to cuddle up on a couch, pour yourself some tea or coffee, and enjoy this simple cake in a good company of friends. I’ve made a few changes to the original Martha Stewart’s recipe, by adding buttermilk to the ingredient list, reducing number of eggs to 3 (from 4), reducing number of apples (6 seemed way too much, so I reduced that to 4). 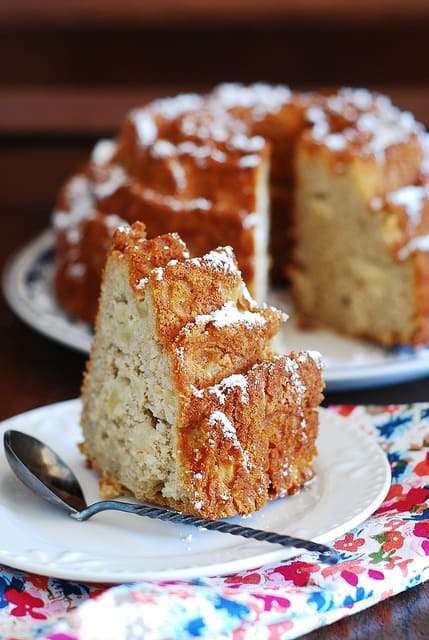 I also did not use the cake glaze (or frosting), because I wanted just good old comfort of the apples and cinnamon. I am also using a rose-shaped bundt pan. 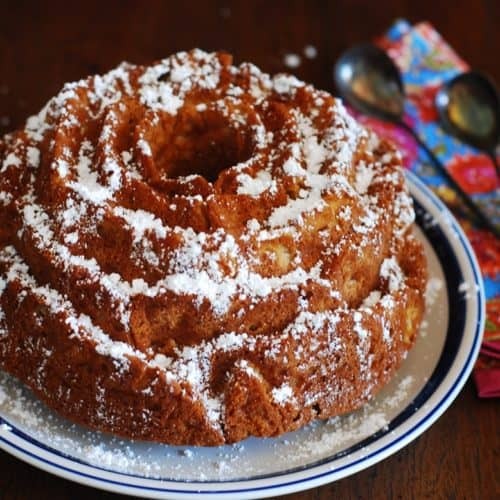 But, before I start describing this Apple Cinnamon Buttermilk Bundt Cake, I want to mention that November will be a very special month for me. I’ve signed up for NaBloPoMo, which means that I will be blogging every single day for a whole month of November, starting today! Check out November NaBloPoMo Blogroll here. Although NaBloPoMo runs every month, November has always been a special month, when a lot of bloggers sign up and there are prizes for some of those who blog daily. To me, it will mean, above all, better time management skills. With a full-time job, holidays coming up, and other every day stuff, I will have to get really well organized to produce quality posts every day. It means I will have to spend less time lurking around other blogs or browsing sites like FoodGawker, TasteSpotting, and Pinterest. I am also planning to diversify the types of posts on this blog. But majority of my posts will remain food and recipe related. I am very excited about this project, and look forward to writing lots of fun posts about recipes and other stuff from my life, usually illustrated with a photograph. 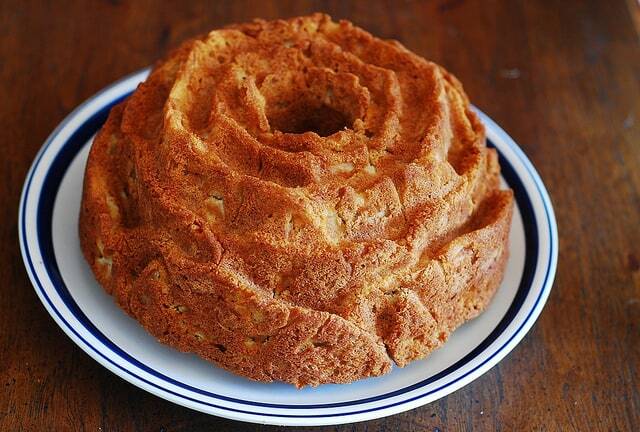 And now, without further due, here is an Apple-cinnamon rose bundt coffee cake, made with buttermilk (or kefir). 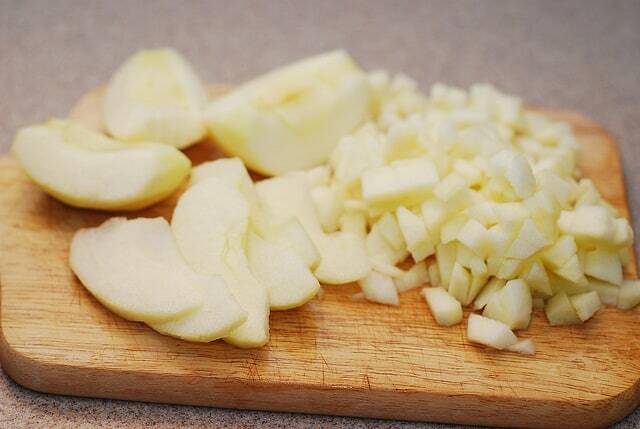 Below are some step-by-step photos to illustrate this recipe. The complete recipe is below the photos, so make sure to scroll all the way down to the recipe. 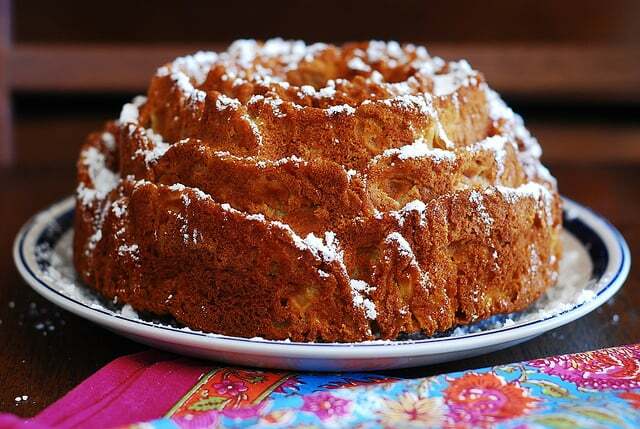 But these photos will show some of the steps required to make this apple cinnamon buttermilk bundt cake. 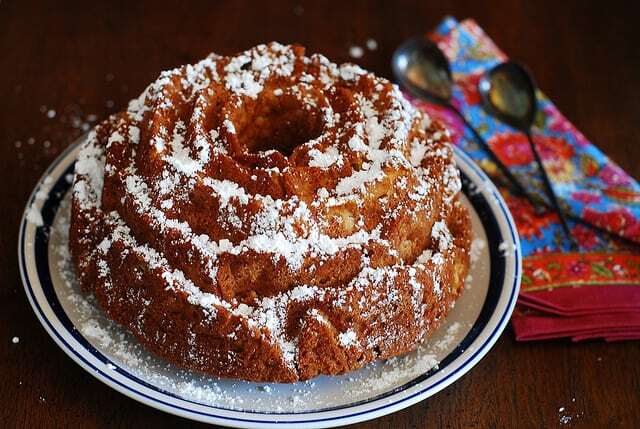 The apple cinnamon buttermilk bundt cake in a rose-shaped bundt pan is finally baked! Nicely browned, golden crust. Yum! 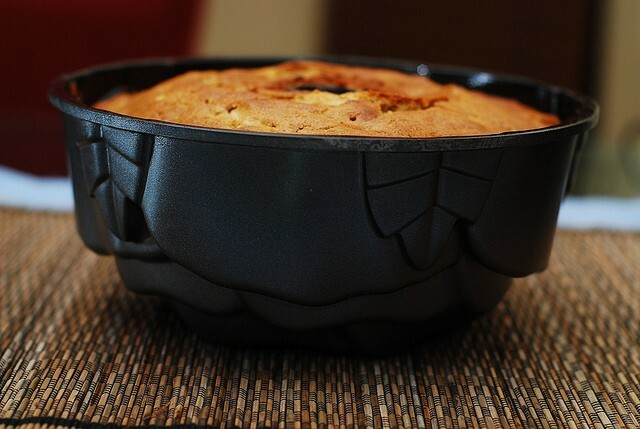 This is to give you another view of rose-shaped Bundt pan. It’s a beauty, isn’t it? Apple bundt cake is out of the bundt pan! It’s time to have a first bite! 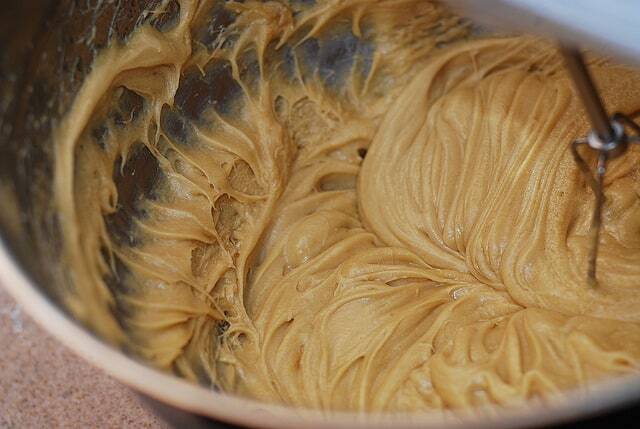 Perfect recipe during the Fall Season. This cake has lots of festive, holiday ingredients. 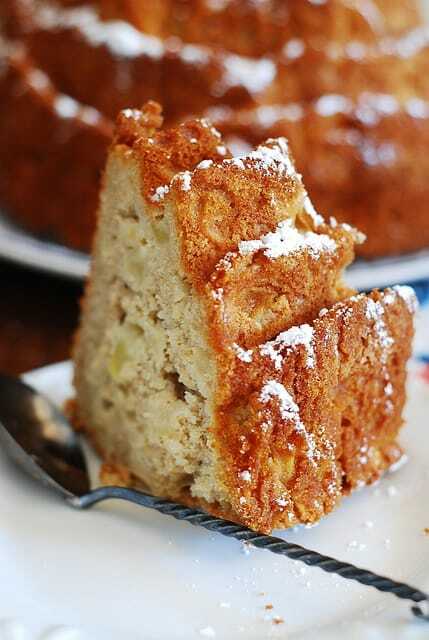 Apple Cinnamon Buttermilk Bundt Cake is easy to make. It's a perfect breakfast choice during the Fall, and a nice dessert for the cold nights. This cake is made in a rose-shaped bundt pan. 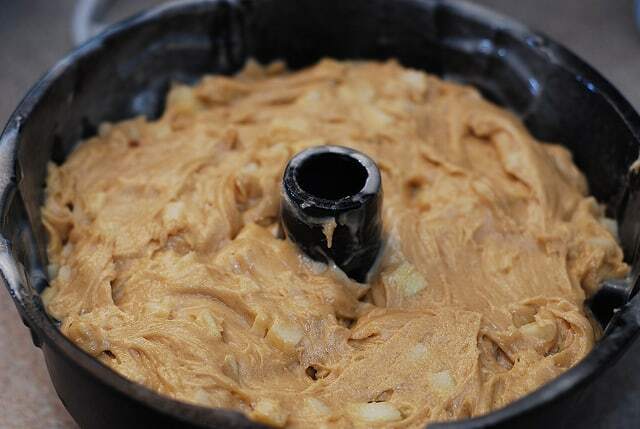 Preheat oven to 350 F.
In a medium bowl, mix flour, cinnamon, baking powder, salt, baking soda and combine thoroughly. In a separate large bowl, add together the melted butter, brown sugar, eggs, and buttermilk (or kefir). Using mixer, combine these ingredients until well-incorporated. 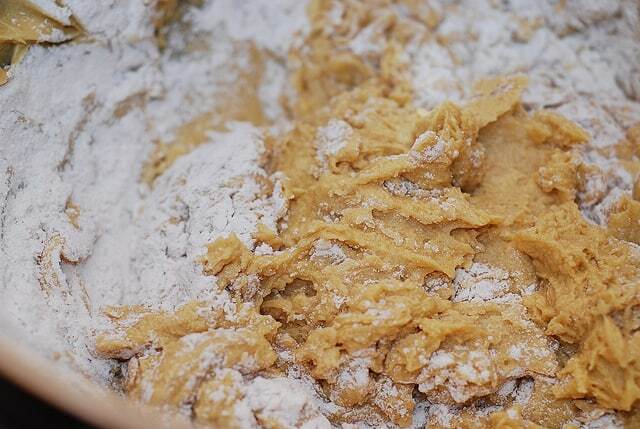 Gradually add flour mixture into the butter-sugar-egg-buttermilk mixture, whisking until all ingredients are well combined. Make sure not to overmix. 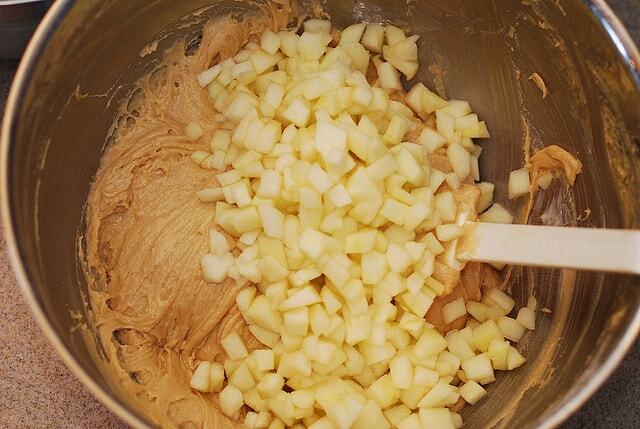 Using spatula, fold sliced apples into the cake batter. 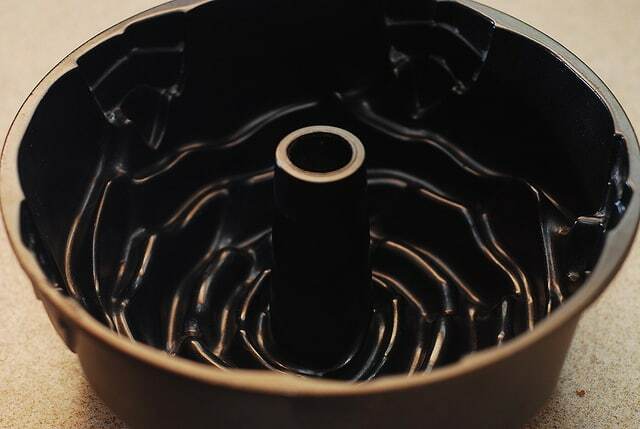 Spray your cake pan with a Baking Spray with Flour (which works great for bundt pans). Because I was using rose bundt pan, I had to make extra sure that all of the pan got sprayed. 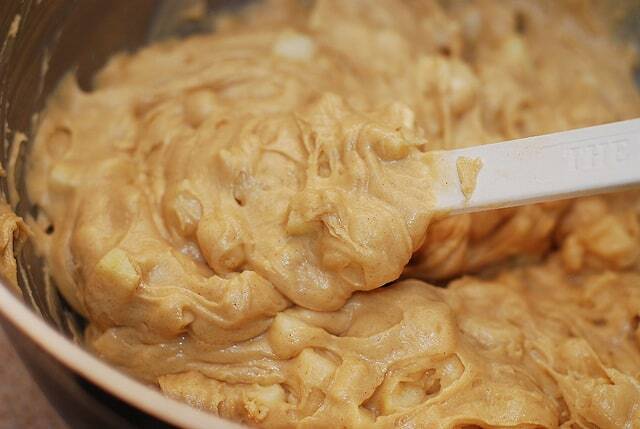 Pour batter gently into prepared pan. Bake for about 1 hour until the toothpick inserted into the center comes out clean. 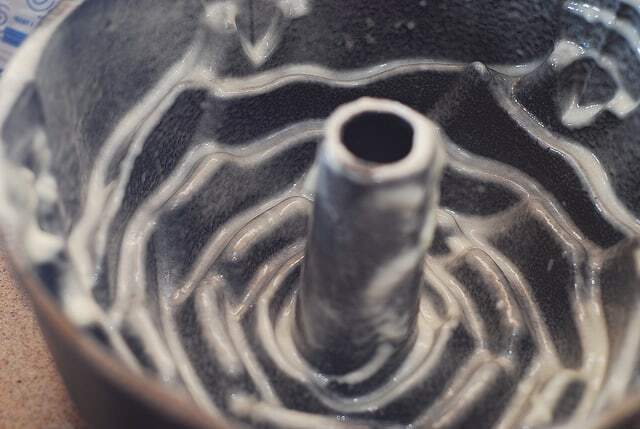 Mid-time through the baking, turn the pan around in the oven for even baking. 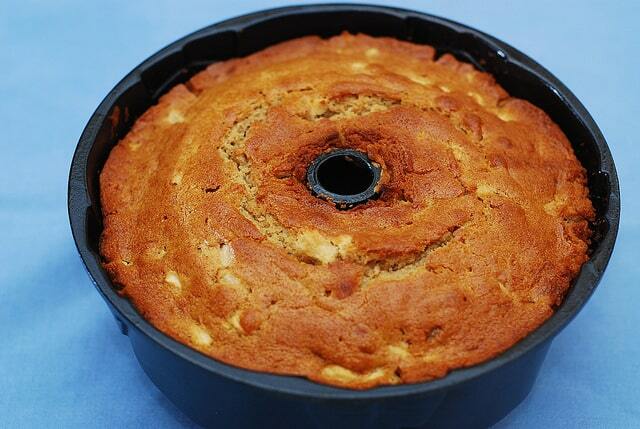 Let the pan cool off on wire rack for about 40 minutes, then invert the bundt pan to release the cake. If you ever have trouble releasing a cake from a bundt pan, I have a method that worked for me each time, which I describe in this Chocolate Bundt cake recipe. Recipe adapted from Martha Stewart. 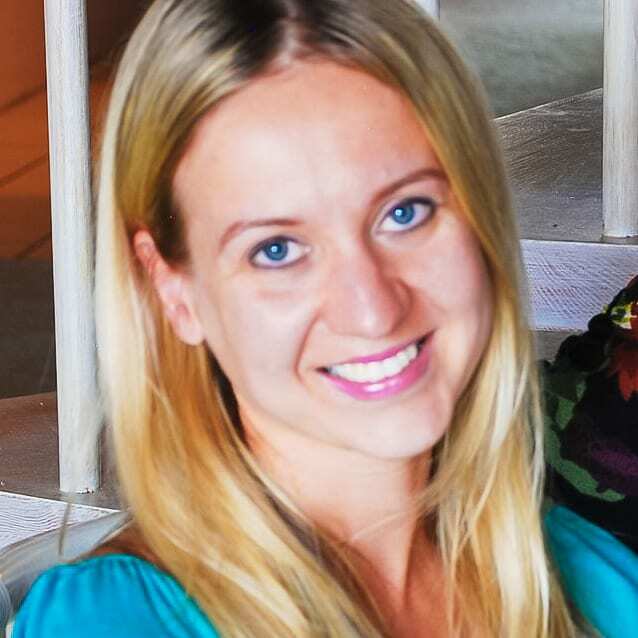 Follow Julia on Pinterest and Facebook to get more recipes and dinner ideas! I made it as a sheet cake, used half the butter, substituted half with applesauce. Cooked for 50 mins. Turned out G R E A T !!!!!! Welcome to my blog where I share easy-to-make weeknight dinner recipes!